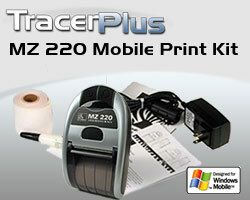 These economical receipt printers integrate directly with TracerPlus via your handhelds bluetooth or 802.11 connection enabling you to quickly print your data onto 2" or 3" wide customized receipts. Each tiny iMZ printer has the capability to connect to a barcode terminal, pda or smart phone using Bluetooth® or 802.11 communication. It is the perfect entry level mobile printing solution for route accounting, line busting and other fast pace mobile jobs.